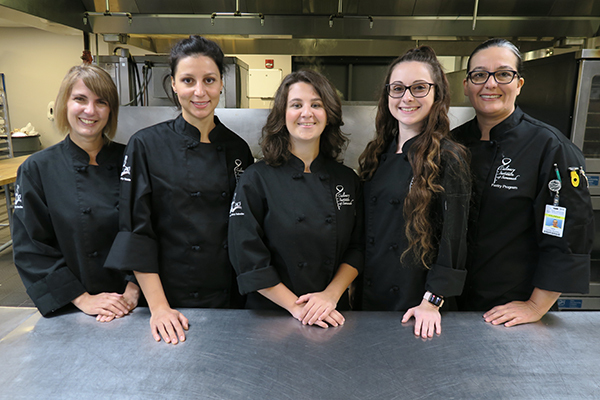 SAVANNAH, Ga. – Savannah Technical College’s Culinary Institute of Savannah has selected five Culinary/Baking & Pastry Arts students to study at the Academy of Toulouse in France this fall. Christina (Tina) Saxe, Alexandrina Arnaulova, Taylor Clore, Katelyn (Katie) Brown, and Laura Martinez were named finalists for the educational exchange based on grade point average and exceptional classroom performance in addition to a culinary competition and personal interviews. These students are now taking online French classes with guidance and additional assignments from STC Culinary Arts Department Head Chef Jean Vendeville. Proceeds from a weekly bake sale from 11:30AM-1PM on Thursdays in the first floor vending area of Goodman Hall at the Savannah Campus (5717 White Bluff Road, 31405 – park at the back of campus near the Eckburg Auditorium) benefit this academic exchange. In late October, three students from France will work baking and pastry internships for four weeks in Savannah, Ga. One student will work as a lab assistant with the Savannah Culinary Institute under the direction of Chef Jean Vendeville, and two of students will work at Perry Lane Hotel at the Emporium Kitchen + Wine Bar under the direction of Pastry Chef Tina Haldeman. All three students will volunteer with other Savannah Culinary Institute students for the Savannah Food & Wine Festival.